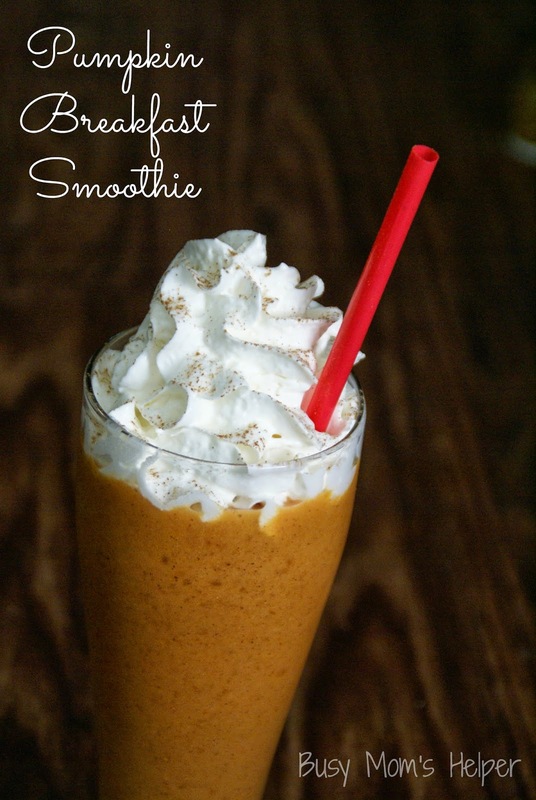 This is seriously so yummy, pretty darn healthy, and definitely hits a spot for those pumpkin lovers! Blend all of the ingredients (except Cinnamon and Whipped Topping) in a blender until smooth. Put some Whipped Topping and a sprinkle of cinnamon on top, if desired. Enjoy!!! Check out these other Pumpkin-inspired favorites! Oh my gosh this sounds delightful! I am definitely adding it to my list of things to make next week! Great, thanks so much Chelsea!!! Let me know how you like it, please 😀 Have a wonderful week! Oh wow this looks great! I love pumpkin!! Thanks, Amber! Pumpkin is totally yummy, right? Do you enjoy it year-round, or mostly fall/holiday time? Danielle, I’d love this healthy smoothie in the morning! I stopped by from Little Miss Celebrations’ link party. Have a nice day! Yum! My husband saw pumpkin on sale the other day at the supermarket & I’d love to buy a few cans to try this, among other festive recipes. I know I could just use the similar squash I’ve got from the farmer’s market, but it’s so much work to make pumpkin silky smooth from scratch. Oooh, what a great smoothie idea! Thanks for sharing at Simple Supper Tuesday. Yum! This looks insanely delish. Adding it to the Top 15 from Foodtastic Friday! Oh thanks so much Becky! 😀 Hope you’re having a fantastic Monday! Aww, thanks so much Deb!!! What a fun site – fun recipes, too 😀 Hope you have a fabulous week! Oooh, I think vanilla yogurt is a fantastic idea – if you try it, please let me know how it works out with that! Thank you SO SO SO much for that feature – totally made my week!!! I’m looking forward to more of your posts for Kids Clothing Week…the hoodie today is so dang cute!!! Thanks a bunch, Lisa! Hope you have a fantastic week! I just tried this and I love it! I switched the applesauce with french vanilla yogurt; it was delicious! I’ll definitely be making this again. I’m so glad you loved it! Oooh…I’m going to try that switch next time, thanks so much for sharing! OKay, this looks insanely delicious. I haven’t always been a smoothie person, but this looks so good I may have to give it a try. Thanks for the awesome recipe! Looks delicious! A great collection of recipes to have on hand! I am a lover of all things pumpkin! We wanted to try something new besides muffins and I found this recipe on Pinterest. Definitely a keeper! My one and three year old loved it!! Only change I made was I used unsweetened almond milk. I’m so glad y’all enjoyed it so much! Ya, I think that almond milk would be a great, also…perhaps I’ll give that change a try next time we make it! Hope you have a great week! Thank you for sharing this on the Pin Junkie link up today. Glad I found you 🙂 I am pinning this to try ASAP! I’ve made this recipe a couple times now and it is AWESOME! So I featured this post in a Thanksgiving round-up today. I hope you don’t mind! Oh I’m thrilled you love it so much, Chelsey! And THANK YOU for featuring it, I really appreciate the sharing 😀 Happy Holidays! This looks so tasty! I might have to make it for breakfast in the morning. My girls love smoothies, but I run out of ideas. I’m right there with you – smoothies are great, but you don’t want the same ones all the time! I hope ya’ll love this one as much as we do! This, I’ve GOT to try! Found you at Tips and Tricks link party. Thanks so much for stopping by, Sharilee! Let me know what you think if you do give this a try! I’m so glad! Let me know how you like it! I would love to post your smoothie in a local recipe page for Mature Mix Magazine. Do I have your permission? You may include a picture, the name and a link/url to my post – but not any part of the recipe. Thank you!